Back in Bitcoin history, when Argentinian millionaire Wences Caseres ( Xapo, Paypal) came across Bitcoin he saw it as a potential solution to the periodic financial turmoil that totally wipes off the wealth of hard working Argentinians. In what I consider a very prudent act of due diligence, he paid a couple of hackers a sizable amount of money to hack and break the fledgling Bitcoin. Their conclusion was that it was unbreakable and that has remained true until today. The Bitcoin protocol has never been hacked. The vulnerabilities were the trusted infrastructure around it like the exchanges. The most memorable being MT Gox. However on the 1st August 2017, Bitcoin main chain forked and a new coin Bitcoin Cash (BCH) came into existence. Some argue that it is closer to Satoshi's vision than the current Bitcoin (BTC) which separate the data portion from the address portion of the data structure. BTC became the main coin because it was supported by the majority of users, developers, Bitcoin businesses and miners in what is now knows as the New York Agreement. After Bitcoin fork on 1 August it became obvious that Bitcoin the protocol did have an inherent vulnerability. This was that if the chain loses mining power it will have to wait a full 2016 blocks before the difficulty can be adjusted to bring the block time back to the normal 10 minutes. This vulnerability was never considered or analysed because until now the miners had no choice but to keep mining on the Bitcoin chain. After the fork however, the whole landscape has changed. Miners have a choice and power to influence the fate of the chain they are mining on. This was brought clearly into focus when the blocktime of the BCH fork went as high as 15 hours per block in the beginning. BCH however was designed with Emergency Difficulty Adjustment (EDA) which adjusted the difficulty even before the 2016 block adjustment period is up. Bitcoin (BTC) does not have this safety feature and cannot have one unless a hardfork is performed to include it. A Chain Death Spiral occurs when the block time increases leading to some miners switching chain. As more miners leave the problem gets worse and a feedback loop results in the dreaded Chain Death Spiral. Bitcoin (BTC) mempool been increasing since after the fork on 1st August. 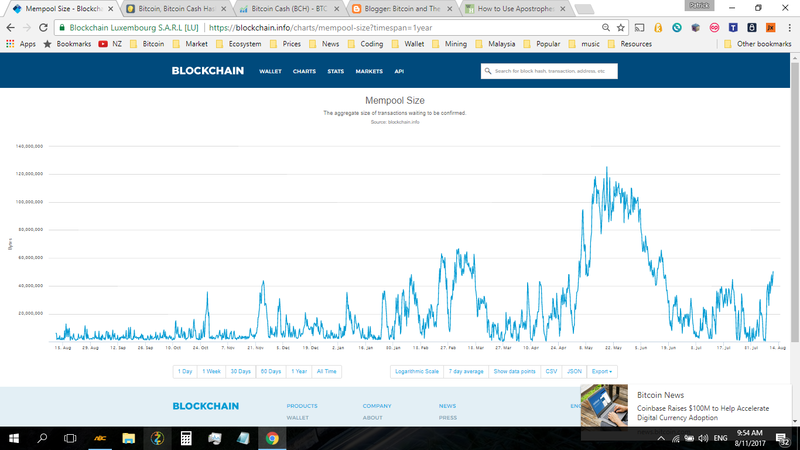 It is currently 52MB which means it will take 52 blocks to clear without any additional transactions. The record was in May 2017 when it reached 120MB. The whole community was in an uproar resulting in a move towards other competing coins for transacting. A picture is forming. Between 8 to 10 August roughly 400 petahashes moved out of BCH which triggered the EDA adjustments then move back in. In addition there was a loss of 200 Peta Hashes on the 9th August and a further 200 Peta Hashes loss on the 10th August. 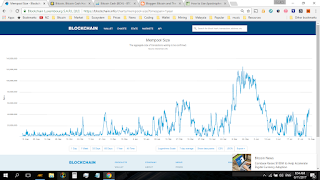 The current BTC mempool is 50MB and blocktime is 10.28 minutes. There is clearly a development and it will get clearer today. Will the 400 Peta Hashes leave BCH again or will the hashing power on BTC decrease further. What happened to the 400 Peta Hashes missing since 8th August. The BTC chain cannot afford further loss of hashing power. Its' blocktime must come back to within 10 minutes and soon. What is certain is that the current price of BTC is not justified with this inherent vulnerability, risk of the dreaded Chain Death Spiral. Have investors totally abandoned any thought of immutable economic security and due diligence? It is incredible how we lose sight of the risks when we bamboozled with riches, hype and misinformation through censorship. It is other peoples' hard earned money and other peoples' investments. Even the possibility that this "black swan event" can happen must be addressed. It should never be censored speech. It's a textbook black swan because majority dismisses it automatically as impossible, yet it's unlikely but possible, and it would be very likely fatal. If bitcoin was the only viable sha256 coin that would be a much smaller danger. In that case the mining power would have to completely disappear for long. It's much more likely if miners can switch, especially if the other chain is more profitable. (1) Mining rewards can only be spent after 100 blocks. Normally that's about 17 hours. If 90% of mining power disappeared that would take a week. So that's a strong incentive to mine something else (if available) in itself. (2) Bitcoin economy grinds to a halt, as transactions become increasingly impossible. This leads many people with coins on exchanges to buy other coins just to be able to transact, which lowers the price, making the alternative chain even more attractive for miners. Which means that, as miners leave, the higher incentive the remaining miners have to also leave. In the event that almost all miners leave the difficulty reset never happens as chain dies. The Fight Against Bitcoin Market The Fundamentals of Bitcoin Market You Will be Able to Benefit From Beginning Today Presently, the marketplace is extremely determined by the purchase price of Bitcoin due to its gigantic share of the crypto exchange. It's apparent that the marketplace is frothy in its present state. You should say that the marketplace is comparable to the share purchasing and selling market-its long term. The Bitcoin market works on the very same strategies that are employed in another kind of trading industry. A thriving Bitcoin market in the usa has a more uncertain future for the time being, and any conclusive legislation in the usa could either have an extremely positive, or an extremely negative influence on the future of Bitcoin.